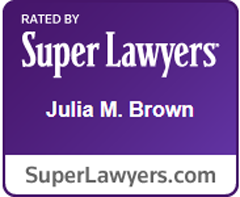 Attorney Brown has been recognized as a “Super Lawyer” in the field of Elder law. The “Super Lawyer” list features the top five percent of attorneys in the United States as chosen by their peers and through the independent research of Law & Politics. The selection process includes a nationwide survey of over 800,000 lawyers, evaluation of attorney background and experience by Law &Politics, and a peer evaluation comprised of leading attorneys from each practice area.